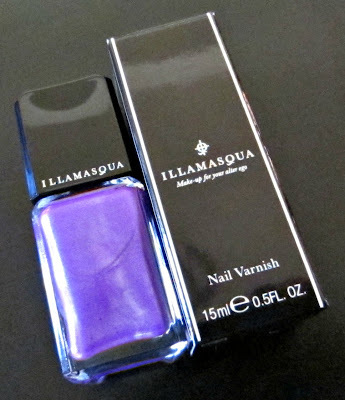 Illamasqua Poke is a "bright violet purple" with an assortment of silver, violet, and blue shimmer. This was sent to me by a dear friend of mine who I need to hire as my personal shopper, because she has impeccable taste! I don't have too many Illamasqua polishes in my collection, and every time I use one, I wonder why that is. The formula is well above average, and they have a wonderful range of shades and finishes. My Sephora F & F code is waiting to be used, so I do believe I'll add a couple of Illamasqua polishes to my order. Poke is a very photogenic polish! I normally take tons of pictures for a product, and end up with a couple that are usable. Every single one of these turned out nicely, but it's still prettier in real life. The blue shimmer is the color that stands out the most to me, and it's lovely. The shimmer colors all contrast perfectly with the purple base, making it look like it has a light sprinkling of sugar over it. We live in an area that produces a large amount of grapes, and this reminds me of a crisp Fall morning when the grapes have been lightly coated with the first frost. I used two coats out of habit, but it was nearly opaque after just one coat. The purple shade shifts from a violet to a rich medium purple color, depending on the lighting. Many thanks to my friend for sending this to me...I love it! OH YEAH! I am a HUGE Illamasqua fan, their polish is lovely. This color is awesome! I would love to have some Illamasqua in my stash, I love their universe and keep reading that their polish is top-notch, but they're a bit pricey for my budget. Seeing your pics makes me want to wear OPI Purple with a Purpose! I don't own anything from Illamasqua and I don't know why! I guess because I really like to see things in person before I buy them, and my closest Sephora doesn't carry Illamasqua. This polish is gorgeous, though! I have this color and love it. In fact, I'm wearing it on my toes right now. It's an amazing shade and the formula for me is amazing. It wears forever! Looks gorgeous! I wish I had more Illamasqua in my stash too. it's very nice! I like it! Beautiful shade! Wish I'd order some of these polishes during the sale.